This is the main page of this site specific installation / performance / participation / sculpture project. Click on the links below to view the different site-specific installation photographs and reviews. This project will only be installed 13 times. Sacred Memories will explore the world’s rituals that venerate the departed including Dia de los Muertos, first observed by the indigenous people of Latin America, China’s Qingming, Korea’s Chuseok, and other rituals practiced in United States, Europe, Africa and the Caribbean. Creation and destruction, time and change, impermanence, indeterminacy, the ordinary. Latex is natural renewable material. It is the sap from a rubber tree. The balloons are made in the United States and Canada. A latex balloon will break down quickly with light and water, about the same as a banana. The invitation is to participate in the inflation from Monday 12 November to Thursday 15 November at the opening at 20 pm. “‘Thirteen Ways of Looking at a Blackbird” is a way to approach the creation and destruction, time and change, and is also a way to approach the international art in the basin of Lake Llanquihue. #6-2007, The LAB, New York City, May 16-25, 2007 This was a fish bowl with low ceilings and scaffolding. Space with lots of viewers, but they were not allowed into the space. I let many in because that is part of the project. Many looked and commented from the windows that are on 2 sides of the space. I had not intended for people to only look from the outside. I was not ready to have them popped, but there are schedules. #5- 2006, Riverside Art Museum, CA. November 17-Dec 31. Reception Dec 7, 2006 Soaring ceilings. Great restaurant. School children. Popped twice, once in the middle and once when I was not there at the end. # 4- 2006, London, SeOne, Oct 13-14, 2006 Black walls and ceiling. All other spaces have been a white box. Used helium and floated masses up to the soaring ceiling. Low lighting and thousand plus people. Looked great. Left at 3 am. Exhausted. Told people they could pop them when they floated down. I was there for almost a week before the official opening. The space was open and people would stop and look into the space. Some would come in and for awhile. The floor had three kinds of Spanish tile, so at the very last minute my brother Bill and I inflated 100 5 inch round and I dropped them on the floor. It was very good idea. I did this again, but more at RAM. There were close to 100 people at the opening. I decided only one form would be popped at the time. Carlos had a private popping. He told me too many people want to pop them. Large space with very high ceilings. I had 3 weeks. At the opening I had the electric inflator and balloons. The idea was that anyone could help inflate and drop into the pile. I would them mass. Some were inflated. I inflated many over the 3 week period. I would assemble and when I would return some had fallen apart. It seems she decided to air the space out and open the windows every morning. I did many different forms. U.S. Consulate Gallery. I had help inflating all the black balloons. They were all inflated and then I decided what to do. I also inflated 100 646 airships and tied black string to them and handed one to everyone who came. The left overs I let go in the room and the floated up to the ceiling. Around midnight I looked in and took some pictures. The Consulate was surrounded by the Italian police. Someone around the first of September 2001 had placed a bomb on the gas pipe on the outside wall of the Consulate. If I wanted my installation up for more than a week I had to pay for security to sit in the gallery. I was going to do this, but then I decided it was long enough and I would just invite people in to pop them. We all took turns falling into the 2×60 twisters that formed a large haystack of black balloons before I passed out pins. Photographs and text description of conceptual art project with reference to Wallace Steven’s poem by the same title. Illusion of simple forms and material as they are connected into different masses on different places worldwide. The project was participation and performative. 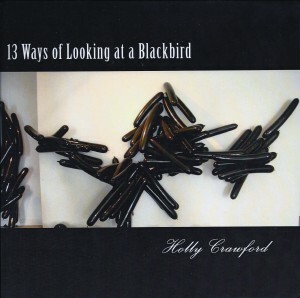 This entry was posted in 13 Ways of Looking at a Blackbird by HollyCrawford. Bookmark the permalink.